Pre-construction conditions on Turkey Branch included exposed utilities. These utilities are vulnerable to damage during floods and excessive weathering, as well as being unsightly. 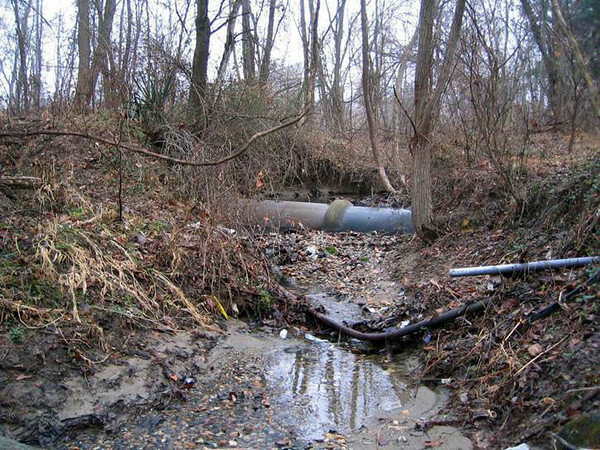 The Montgomery County Department of Environmental Protection (DEP) received a $2 million TE grant in 2000 to construct channel restoration and habitat improvements in Rock Creek Park. In an effort to restore and protect the Rock Creek watershed, which ultimately drains to the Chesapeake Bay, this project added modern stormwater controls to 730 acres to the Turkey Branch Stream subwatershed (approx. 30% of the drainage area). The project including work along 12,000 feet of the Turkey Branch Stream, along 13,400 feet of the Sycamore Creek, and along Joseph's Branch Stream. The Rock Creek watershed drains approximately 60 square miles.